What this Success Quote tells us? The prime message that this Success Quote intends to deliver is that in order to achieve success you need to have a well aligned and systematic approach. Success, in other words becomes extremely achievable and accessible if planned in a step by step method. Success is conceived in the womb of efficient and impeccable planning. The extra kick needed to boost your morale and the key derivation of original Success is very much possible, if proper detailing and attention is paid to keeping the right things in the right place, so that they can be used in the right time. There is no doubt, that success does not come that easy to you. Achieving targets or pre-determined goals should undoubtedly be a priority, but it should be given the support of a strong step by step planning. Go the step by step way. 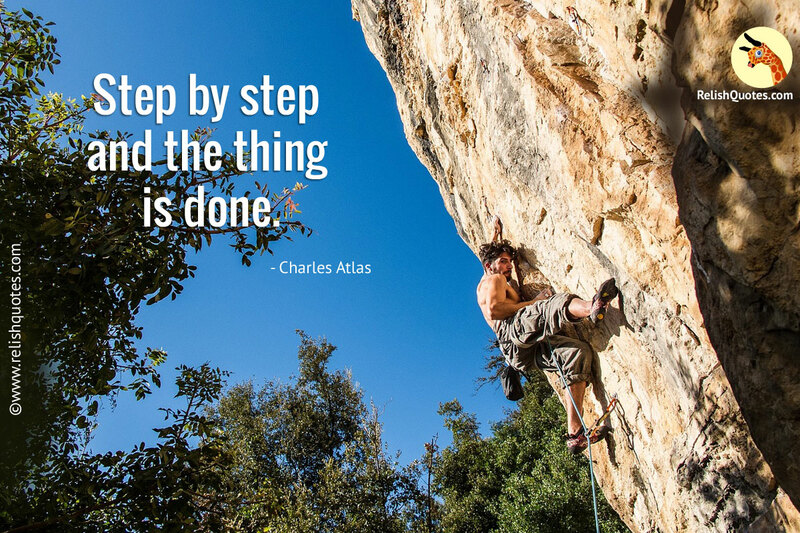 Take a baby step at a time. No matter how tough the circumstances around you build up to be, when you have things set in the right track, arranged in a step by step manner, nothing can stop you from victory. If you wish to achieve and gain your targets, if you dream to make a mark, if your heart desires to set become an exemplary in your field, then working using the step by step methodology, guarantees you a victory in any spectrum of life. There is a vast gamut of opportunities, occasions, situations that you face and experience on your personal and professional front, that requires and call for going the step by step way. Whether it is solving an issue at your work desk or detangling a complication in your relationship with your loved one. If you have adapted working through the course of your life, the step by step way, you have decoded the route to guaranteed Success.